On a hot August evening in 1974, I hauled my case up a cobbled street of uneven red brick in Pittsburgh, USA. Exhausted after my trip by greyhound bus from New York via Philadelphia, it was a relief to finally reach the neat three-storey house with its covered porch and white rocking chair on the veranda. I still remember the look on the woman’s face at the door: an open-eyed, slightly startled gaze, a hazy faraway look that I came to learn was her normal expression. My aunt and I hadn’t met before and there was lots to talk about. That 1974 summer was packed wit h new experiences as I visited the US for the first time armed with my J1 visa and a student loan of £100. The country I left was scarred and scared by the deaths of 33 people in the Dublin and Monaghan bombings in May, the largest number of causalities in a single day since the start of The Troubles. We were glad to get away. A crowd of us students piled into an apartment in Manhattan for a few days before word reached us that there was work to be had at Mullins’ Resort at East Durham in the Catskills, upstate New York. There we headed and soon I was doing the chamber maid rounds of bed-making and cleaning for the droves of Irish and Irish-Americans who swayed to traditional music into the early hours in the resort pub. The tips were good and with the favourable exchange rate we returned home with enough savings to cover our expenses well into the following year. Maria ran her house like clockwork, trained in the grind of years of service in the homes of the Pittsburgh wealthy. Her hot press was packed with starched table cloths and neatly folded bed linen; the silver cutlery gleamed on the dinner table. Both of us understood that this was a far cry from the place she had left over half a century earlier – the thatched house that was home to her parents and seven children in the village of Gurteen, outside Ballyhaunis in east Mayo. She was born in 1904 and her life would span almost the entire twentieth-century. She left the country in 1922 in what should have been a new beginning of hope and promise with the signing of the Anglo Irish Treaty. Instead, the country started to tear itself apart through the Irish Civil War. Her clearest memory of leaving was of bending down to kiss the sleeping form of her baby sister, seventeen years her junior. She spoke about President Nixon in a thick Irish accent. A couple of weeks earlier I had stood in front of a TV screen in upstate New York and listened as Richard Nixon announced, ‘I shall resign the Presidency effective at noon to-morrow.’ Brought down by Watergate. The images were dramatic and tragic as he and his wife boarded a helicopter on the south side of the White House, waved goodbye and then disappeared into the summer skies. Aunt Maria had little time for Nixon, her hero still the late President John F Kennedy, her sorrow still palpable a decade after his assassination. She basked in the glow of the glamour of the emigrant son who made it to the very top echelons of American life from ancestor beginnings similar to her own. President Kennedy’s picture adorned the walls of her Pittsburgh home. We talked about Gurteen, the townland of her birth. Yes, I said, the old house was demolished but her only brother, John, had preserved one gable wall as requested by his sisters. What did she miss most? It was the surrounding fields, the hilly ones like a necklace of small drumlins. These were the places where they ran and played as children and jumped the streams, laughing as they crossed to the other side. She would like to walk those fields again. It might soothe her soul, for she had known tragedy having lost her husband and one of two sons in recent years. She appeared worn down by loss and loneliness. ‘You must come back,’ I said. She did return to a few years later. I drove out from my home in Limerick to collect her at Shannon Airport and then traveled via Gort and Galway to the places of her childhood. My mother welcomed her and, for the first time in half a century, the flesh of the sisters touched. They all gathered, and talked, and reminisced. Maria stood by her parents’ graves and wept. Her brother took her out to the hilly fields, where they slowly walked. My memory of that visit is of her slightly startled and dazed expression which I first observed in the Pittsburgh doorway. 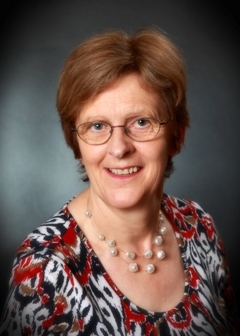 When I left her out to Shannon Airport to catch her flight back to the US, I turned away, unable to watch an old woman move slowly through the airport departures lounge. By then, Richard Nixon was in quiet, reclusive retirement. Oranges and chocolate were exotic extravagances in my childhood; pointers to a future when these would become normal daily purchases and not occasional luminous luxuries. In our 1950s childhood home in East Mayo, an orange was a sporadic treat; the fruit was carefully peeled, divided in four, the white pith discarded and each succulent segment lustily relished by us four siblings. As for the bar of Cadbury’s Dairy Milk in its wild-Atlantic blue wrapper, this was one of my mother’s few indulgences. When my father returned from an outing to the nearby Ballyhaunis, there were no surprises. Each time he opened his coat pockets, lifting out the treats: a brown paper bag of sticky sweets for us children, a bar of Cadbury’s Dairy Milk for our mother. On Wednesday afternoon of Easter week, 1916, just a month before my mother’s birth, a young couple sat on grass at Killiney Hill, Dublin, looking out on a peaceful panorama of water and sand. The artist Cesca Trench and her friend Diarmuid Coffey, an Irish Volunteer, were enjoying their picnic treat of oranges and chocolate purchased in Dun Laoghaire. It was a tranquil scene, almost like summer, with the blue misty water of the bay curling around the sand. It seemed impossible that there was a revolution going on in Dublin at those very moments. Diarmuid looked white and tired. Cesca was worried. The atmosphere was tense at home in Temple Hill, Terenure, she told him. She felt pulled apart; her mother needed her and was worried that her daughter could be arrested at any moment. Cesca Trench was an unlikely nationalist. Born into a leading Anglo-Irish Protestant family, she was reared in a vicarage in Kent. Her three brothers had joined the British army on the outbreak of war two years earlier. Cesca’s interest in Irish nationalism blossomed on Achill Island, west of my Mayo birth place, when she attended Scoil Acla gatherings in 1912 and 1913. In Achill, she sketched endlessly, walked the strand at Keel Bay, took Irish lessons, and exulted in ceili dancing and pipe music in the evenings. It was in Achill that she first met the tall, gangly Diarmuid Coffey who relentlessly wooed the reluctant young artist. Soon, she was deeply involved with Cumann na mBan. Cesca was incredulous when, on Easter Monday, she heard that the Sinn Feiners had risen up and taken all the main bridges in Dublin. The action seemed to her totally mad. But she woke on Tuesday morning full of determination. She tore cloth into strips for bandages, bought needles, iodine and lint in Terenure, and headed out on her bicycle. She cycled down Grafton Street, round by Henry Street, leaving her bicycle at No 91 for fear of getting a puncture in the broken glass. She walked boldly to the GPO door and gained entry. That evening she wrote in a notebook with a cherry-brown cover: ‘..I saw things I shall never forget, a row of young fellows kneeling and saying their prayers and two priests came in while I was there, and began to hear confessions kneeling by the side of them; at a little distance a Proclamation to the people of Ireland – of the Irish Republic…’. The Rising was quickly over. Cesca was not arrested. She remained busy with her art work and her Cumann na mBan meetings and a year later, in March 1917, finally agreed to marry Diarmuid. The wedding took place in April 1918, just days after the death of Cesca’s beloved brother Reggie at the western front. Six months into the marriage, Cesca fell victim to the flu epidemic sweeping Europe and died on 30th October 1918. The last entry in her diary was for a Cumann na mBan meeting which she never attended. Surely, in the years and decades that followed, in the years when my parents grew to adulthood in an independent Ireland, surely Diarmuid Coffey would have recalled an idyllic afternoon savouring oranges and chocolate with Cesca on a grassy hill in Dublin as revolution surged through the capital. Some weeks ago, before the most recent heartbreak for the Mayo football team, I reminisced on Jones’ Road, Drumcondra. 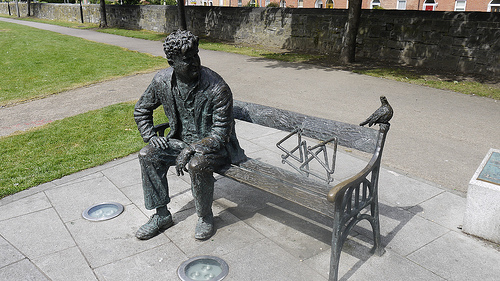 As I crossed Binn’s Bridge, Brendan Behan was leaning towards me on the metal bench, seemingly watching my every movement. But it was the blackbird perched beside him on the Royal Canal seat that engaged his attention – the pair seemingly enthralled with each other’s company. The bronze sculpture a signal that I was entering Drumcondra which was an oasis of quiet that Sunday morning. Walkers with ruck sacks headed westward along the canal bank footpath; landscape contractors sprayed the hanging flower baskets on Clonliffe Road; rays of morning sun highlighted the red of rose and rhododendron in neat gardens. Soon I was on Jones’ Road bordering the west boundary of Croke Park, walking up the incline between the stadium’s railway and canal ends. Memories of other Sundays in that place, on that road, inundated me. I have a love/hate relationship with Jones’ Road and with Drumcondra. Walking towards Croke Park on the third Sunday in September, when Mayo once again contest the All-Ireland Football Final, I have an impression of a place always sunlit, of excited voices, sharp banter, wrangles about ticket,; the scene a mish-mash of green and red mingled with the opposition colours – more often than not the green and gold of Kerry. Then, the gloomy return journey several hours later. An autumn chill, it seemed, in the evening air. Green and red flags drooping. But what I remember most was the quietness among the Mayo supporters walking, heads bent, braced for the long journey west. Few words. What was there to say at the hurt of another defeat? Too young to remember, I was just a toddler in a Mayo village close to the pilgrim road from Ballyhaunis into Knock, when Sean Flanagan – the Mayo Captain from nearby Ballaghaderreen – lifted the Sam Maguire cup sixty-four years ago when Mayo last won the All-Ireland football trophy. Too young to remember, but soon old enough to hear the talk year after year of the homecoming bonfires that lit the autumn skies across east Mayo – in Ballyhaunis, Bohola, Crossmolina and Kiltimagh – to greet the victorious team that September. It was 38 years before Mayo returned to an All-Ireland Final against Cork in Croke Park. That year, 1989, we had reason to hope, so often enthralled by the sublime feats of Willie Joe Padden as he soared to fetch the ball and it seemed as if he must pierce the clouds with his astonishing leaps. I was then married to a north Dublin man whose memories of lower Drumcondra are saturated with the boyhood smells of stale milk from the family van on its milk rounds through Drumcondra streets like Whitworth Road and Fitzroy Avenue. By then I was mother to two small sons who were absorbing the city passion for Munster rugby in our Limerick home. The three of them would learn to live with my peculiar addiction to the wearying cause of Mayo football. In 1996, even if we were missing the blond, tattooed Ciaran McDonald – absent for the summer in America – we converged on Jones’ Road in hope. If only that game with Meath was won on the first outing when the sun still radiated the heat of summer. For the replay, two weeks later, the summer was well and truly over, the days had shortened and we were chilled to the core. The banter with Meath supporters who spoke of their ancestors trading small farms in Mayo for the rich pastures of the Royal County did little to lessen the disappointment. And pain continued to be heaped upon pain for Mayo football supporters into the new millennium. Surely, if the Mayo team were to win the All Ireland, the spirits of the living and the ghosts of the dead of the County would exult with ecstasy from Swinford to Sydney, from Belmullet to Boston, from Louisburg to London. Crossing the Royal Canal after such a victory, Brendan Behan would totally ignore the victorious Mayo supporters and continue to chat to his blackbird. It would make no difference to him at all.